There's a new website called Evonomics devoted to critiquing the economics discipline. They've got quite a lot of interesting writers and advisors, including (but not limited to) Paul Krugman, Joe Stiglitz, George Akerlof, Robert Shiller, David Colander, Jonathan Haidt, Yanis Varoufakis, David Sloan Wilson, and many more. The site appears to be attracting a ton of traffic - there's a large appetite out there for critiques of economics. In any case, I noticed David Sloan Wilson is writing a series of posts criticizing econ as a whole, and I thought I'd go through one of them and see what I thought was right, and what I thought was wrong. Wilson can get a little grandiose, likening the econ profession to the orcs of Mordor and himself to Frodo. But let's look past that and talk about the substance. Here are a few points in Wilson's essay that I don't completely agree with. Economists were very smart, very powerful, and they spoke a language that I didn’t understand. They won Nobel Prizes...Nevertheless, I had faith that evolution could say something important about the regulatory systems that economists preside over, even if I did not yet know the details. After all, financial markets and other regulatory systems are products of cultural evolution, based on psychological processes that evolved by genetic evolution. Like I said a while ago, I'm not as confident that evolution is the key to economics. Wilson has spend his career thinking about evolution, and when you have a hammer, everything looks like a nail. But the analogy between cultural evolution and biological evolution is only a loose one - nobody yet knows how cultural traits get passed on, or even how to define those traits. And there's no guarantee that the principles involved are similar to those that hold in biology. As for genetic evolution being important for economics, that's possible, but I think the overreach of evolutionary psychology - a field that gets criticized as much as econ itself - should give people pause. So I'd be cautious with the cross-disciplinary analogies. But hey, it's surely worth a shot. I don't want to be a naysayer. Give it a try! Like the land of Mordor, [econ] is dominated by a single theoretical edifice...The edifice is based upon a conception of human nature that is profoundly false, defying the dictates of common sense, before we even get to the more refined dictates of psychology and evolutionary theory. Yet, efforts to move the theory in the direction of common sense are stubbornly resisted. I'm not so sure I like the emphasis on common sense.. Science usually places a premium on counterintuitive results, and "counterintuitive" is the opposite of "common sense". If common sense was a good guide to reality, scientists wouldn't be nearly so useful, would they? The list of amazing science facts that seem to defy common sense is long - How can matter be both a particle and a wave? Etc. etc. In econ, common sense might that when two countries trade, one wins and one loses, but the theory of comparative advantage shows that it's very easy for that not to be true. I'm not saying that comparative advantage is always a good theory of trade, but it certainly shows that demanding that all econ theories conform to common sense is overly restrictive. There is plenty of dissent among economists, and some of the best are working the hardest for change. The folks who award the Nobel Prize in economics don’t like the edifice that much either, and often add their weight by awarding the prize to the contrarians. The first sentence is definitely true. But I'm not sure Wilson is right about the Nobel a force for rebellion. The Nobel has gone to quite a lot of people whose work forms the very foundation of the "edifice" that Wilson talks about. In fact, the vast majority of the prize winners from the past three decades have worked within the rational, individual-choice framework that Wilson doesn't like. In fact, people like Thomas Sargent, Ed Prescott, and Bob Lucas built the very modern macroeconomics that Wilson recoils at...and they got Nobels for it. Economists were much more closely attuned to common sense and evolutionary theory before the volcano erupted. Adam Smith observed that people following their narrow concerns somehow combine to make the economy work well, as if guided by an invisible hand. Today we use terms such as emergence and self organization to describe this phenomenon. It is spectacularly demonstrated by social insect colonies. I also think this isn't really right. Smith was certainly not inspired by modern evolutionary ideas, since On the Origin of Species was published almost a century after The Wealth of Nations. It's not at all clear that Smith believed the "invisible hand" worked analogously to an insect colony; he didn't really specify the mechanism. (Not that insect colony self-organization is a good example of evolution in action, anyway - though ants certainly evolved the biological means to self-organize, the process by which they do so on short time scales is not really very similar to biological evolution in most respects.) In fact, the general equilibrium economics that Wilson doesn't like is supposed to represent Smith's invisible hand. The people who inhabit the economic models, often referred to as Homo economicus, are driven purely by self-regarding preferences. Mathematically, this means that they care only about maximizing their own interests without reference to anyone else’s interests. What I want cannot depend upon what you want. Actually, that's not right. When externalities are present, people's utility can depend on other people's consumption. Externalities are very common in mainstream economics, and the concept is taught in every (good) econ undergrad course. Next, people who inhabit the mathematical kingdom are infinitely wise in pursuit of their self-regarding preferences. This is, sadly, true. Economists have played around with a number of ways to drop this assumption, but they haven't reached a consensus yet, and - in my opinion - still have far too much trepidation about modeling incompletely-rational behavior. Once again, these absurd assumptions were driven not by ideological bias but by the tyranny of mathematical tractability. The theory couldn’t be pushed in the direction of common sense because it would become impossible to grind through the equations. This is partly true. Ideological bias probably does play some part in economists' unwillingness to allow irrationality, or things like social preferences, into their models. Tractability concerns can play a role too. But there's also the underlying problem that it's just very hard to make a general mathematical model of human behavior. Anyway, I like that Wilson is thinking about economics, and saying provocative, challenging things. There's really very little downside to saying provocative, challenging things, as long as you're not saying them into the ear of a credulous policymaker. At the very least, Wilson will provoke some fun arguments with economists. At best, he'll inspire some to start tinkering around with models based on evolutionary principles. Who knows - that might even get some good results someday! But in the meantime, I'll keep trying to help nudge Wilson toward an accurate picture of what's going on in the econ world. 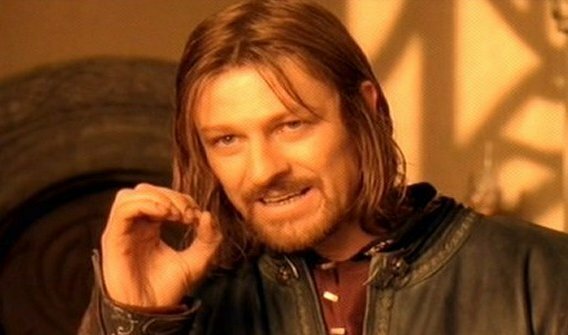 After all, if you want to be Frodo and sneak into Mordor, you should make sure you have a good map - otherwise you might just end up in New Jersey. I wouldn't say I'm complacent at all. Macroeconomics obviously needs some big changes - the crisis and Great Recession showed that, though it should have been apparent long before. The "boat" of macro definitely has substantial holes in its hull. OK, so suppose you decide that the boat can't be patched up or repaired, and it's time to abandon ship - to completely change the way we do macroeconomics. How do you know which boat to jump to? If you jump into a non-seaworthy boat, you could be in even bigger trouble than before. My life’s work gives me a panoramic view of the human-related disciplines such as religion, sociology, the humanities, and the philosophical tradition of pragmatism, to list a small sample. The very fact that I and like-minded colleagues can do this (it is a perspective, not an individual talent) suggests that evolutionary theory has a generality that orthodox economics aspired to and failed to achieve. Well first of all, just because David has made a bunch of similar claims about how evolutionary thinking can be applied to a bunch of other disciplines doesn't mean those other claims were right. In fact, not knowing much about religion, sociology, or the humanities, I'm not in a position to evaluate them - nor, I suspect, are most of David's readers. But if there's a general consensus that evolutionary thinking has successfully improved and transformed most fields of humanities and social science, I'm not aware of it. I should probably read more. But more importantly, there's just no reason to think that a conceptual framework that works in one discipline should work in another. Why should ideas that work for religion -- whatever that even means -- also work for economics?? It just doesn't make sense. There's no grand theory-of-theories that tells us that all disciplines and all phenomena must act according to some basic universal underlying principles. Physics methods don't usually work for biology. Why should we think that biology methods work for economics? Yes, mainstream economic models weren't a lot of help in the crisis or the recession. But how confident can we be that making economic policy based on evolutionary analogies would be any better? Before I believe that, I'll want to see some good hard evidence. By giving only a tepid critique, you're (mis)leading your readers to believe that DSW isn't just misrepresenting economics as badly as every single other article on that website. The situation is this: political economics (= agenda pushing) dominates theoretical economics (= science) since the founding fathers and has not produced much, if anything, of scientific value since the last 200 years. Heterodoxy has always argued that something might be wrong with Orthodoxy. To be sure, Heterodoxy’s rejection of Orthodoxy is right. In 2016 no thinking being can defend orthodox economics any longer. The problem with traditional Heterodoxy is that it has not produced much, if anything, of scientific value either. Economics is what Feynman famously called a cargo cult science because BOTH Orthodoxy and traditional Heterodoxy does NOT satisfy the scientific criteria of material and formal consistency. Evolutionary economics is part of Heterodoxy since Thorstein Veblen asked: “Why is Economics Not an Evolutionary Science?” The next was Marshall with his famous call for a new methodology: “The Mecca of the economist lies in economic biology.” Evolutionary economics is institutionalized in different countries and communicates its research in the Journal of Evolutionary Economics. David Sloan Wilson has had a great insight: “Nevertheless, I had faith that evolution could say something important about the regulatory systems that economists preside over, even if I did not yet know the details.” This insight has occurred many times before and it is only new and exiting to the average dull Econ 101 student. David Sloan Wilson advertises a common sense approach. This, of course, appeals to all economists who have not much more than that. As a matter of fact, Wilson’s approach is fundamentally flawed. The first thing to be clear about is: economics is NOT about psychology, human behavior, sociology, politics, biology, anthropology, etcetera. Economics is about the properties and the working of the economic SYSTEM. ALL Human-Nature approaches are bound to fail. The ultimate reason can be stated as a methodological impossibility theorem: NO way leads from the explanation of individual behavior to the explanation of how the economic system works. "The first thing to be clear about is: economics is NOT about psychology, human behavior, sociology, politics, biology, anthropology, etcetera. Economics is about the properties and the working of the economic SYSTEM." Egmont you are really repeating the same types of mistakes that set off the delusions of the likes of Walras and Sargent. I tried to read a couple of articles on the Evonomics site and there was too much noise and subjective assumptions treated as givens without explanation for me to continue. This is, sadly, true. Economists have played around with a number of ways to drop this assumption, but they haven't reached a consensus yet, and - in my opinion - still have far too much trepidation about modeling incompletely-rational behavior." I don't see the issue with this. Given the amount of possible information in a model, questioning the results will always occur. People tend to be motivated differently towards preferences as well (www.totalsdi.com). Similar to law, the person who is the most fair and objective is the result people gravitate towards. In the long run, the brand that is fairest will bring the most information wealth and people will shift there. "But there's also the underlying problem that it's just very hard to make a general mathematical model of human behavior." It's also hard to make a general mathematical model of a dog. So biologists don't try, they use other tools. Maybe mathematics just isn't the right tool for understanding human behaviour. So, the point is NOT “that it’s just very hard to make a general mathematical model of human behavior” but that there is NO NEED to make such a model. To speculate about constrained optimization, bounded rationality, animal spirits, or rational expectations is just as brain dead as to speculate about how many angels can dance on a pinpoint. Now, go and wake up your Econ 101 teacher and tell him that he is fired. Hudík, M. (2011). Why Economics is Not a Science of Behaviour. Journal of Economic Methodology, 18(2): 147–162. Robbins, L. (1935). An Essay on the Nature and Significance of Economic Science. London, Bombay, etc. : Macmillan, 2nd edition. Egmont the economics profession for sure violates any scientific norm and submits to an edifice that would be totally unacceptable in any other discipline. But perhaps you need to do some critical theory. What does the word economy really mean? It came from a Greek word which means what? And what does 'currency' really mean? Perhaps studying how a monetary system works is what economics was always supposed to be about? Not sure about this evolutionary economics stuff at all. There is a bit of a case for a perpendicular position, that the natural evolution runs on something like what we think economics should be but human cultural systems have transcended evolution and operate in a fundamentally different manner. If you offered a monkey the option of a banana now or 1.2 bananas next year or an unlimited supply of bananas in monkey heaven it would take the one banana now. Not so with humans, we still feel hunger as evolution made us, but our eating choices are remodeled by culture. Culture has great benefits in enabling wildly-enhanced cooperation and some resistance to our evolved impulses, but we equality can follow culturally driven preferences to destruction. Culture changes over time, on the positive side by people taking up better and more productive ideas, but often by tribes of one kind or another slowly going down the tube, unable to resist their foolish mores or even distinguish them from reality. As cultural is essentially collected accidentally, this process more resembles a random walk when compared to the exigency driven outcomes of natural selection. You just described variation and selection. This is the core of any evolutionary process. It just so happens that here it applies to human behaviour. I'm glad to see people are jumping on the bandwagon of economic critique. There simply should not be a Nobel price in this area. I consider the Nobel in economics a political, greedy joke. It is all a giant mess. It would be easy to sort out if there was an incentive to do so, because economists are generally smart people. They just haven't been given the incentive to fix what is wrong in their field. Perhaps this new website will help. Noah, I'm pretty sure you're wrong about how natural scientists view "common-sense" vs. "counter-intuitive" claims. Consider how the founders of quantum mechanics reacted to their theoretical discoveries: they generally resisted the non-common-sensical implications until the evidence forced them to accept those conclusions. I think that generally, outside of economics, and counter-intuitive claim requires at least somewhat higher standards of evidence than claims that seem to fit with common sense. Economics is unusual, if not unique, it its eager and immediate embrace of counter-intuitive claims. Sigh, I seem to be having problems posting here. Last time it happened I wrote a new comment a day after the first one and they both showed up together. I wrote one yesterday, but still not up. So, I am going to essentially repeat it. If you see two looking similar that is what is up. So, as a coauthor and coeditor with David, if not a participant in Evonomics, I note a couple of things. One is that there is a wide variety of quality of articles there. Some are great; some are not so great, although I am not going to get into listing which is which here. But the site certainly serves a useful purpose. The second is that there is a wide variety of evolutionary approaches to economics, with some of them around for a long time. Probably oldest is the Veblenian old institutionalist approach embodied in the Association for Evolutionary Economics and its Journal of Economic Issues, which stresses the evolution of institutions according to Darwinian principles. Another is the Alchian-Demsetz-Friedman essentially neoclassical view of evolution as the handmaiden of micro competition, dating from Alchian's famous article in 1950. Another is evolutionary game theory, around since the 1970s and partly comeing from evolutionary biologists like the late Maynard-Smith, although more clearly codified by the late Reinhard Selten. Both this and the former have to some extent been adopted by microeconomic orthodoxy. Then there is the neo-Schumpeterian strand coming down from the famous work of Nelson and Winter in the 1970s, still somewhat heterodox and ultimately deriving from Schumpeter, who had strongly saltationalist views of evolution. Then we have Santa Fe Institute self-organizing forms of evolution coming from the work of biologist Stuart Kauffman, but with many economists following this, with me one of the fans of this stuff. Finally there is a return to more sharply biologically based ideas, which I would identify David with. Finally, although David somewhat disses math, he is not against it totally, with the so-called Hamilton-Price equations rom the 1970s underlying the arguments for multi-level evolution, which is David's prime baby. I note that those equations were actually developed in the 1950s by James F. Crow, a close associate of the late Sewall Wright, a fact that I think David is aware of. Oh, and Egmont, even your supposed solution to how to do econ involves some at least simple math in the form of all those accounting identities that you think explain everything. Nelson and Winter actually have a variant of 'fisher's fundamental theorem of natural selection' in their stuff (related to hamilton-price equns). I think its also related to classical general equilbrium, and even 2nd Law of (i forget what it is-- maybe thermoastrology, which predicts the future of time) --- they are all same equation in my view (and idea, and all suffer same problems, which people have been trying to fix for last 150 years or so since boltzmann). I hear Marx may have wanted to dedicate his book to Darwin (and others say Darwin got his ideas from one of the key figures in the garden of eden and bible , Adam (smith). (S Keen updated the marxian evolutionary model --Goodwin). (Not being an economist (though my father actually took classes from m friedman and i read some of his old books---had alot of classics---marshall, lange and lerner, hayek, samuelson...) when people say 'economists believe...' to me that sounds like 'christians (or muslims...) believe ' such and such. I used to sample maybe 10 to 20 different econ journals (jebo and J ec th seemed more my type ) ; the only ones that came closest to the stereotype of 'what economists think' were AER, JPE, and another one. Even those had some 'heterodoxy' (a la Kirman). (I think Egmont's stuff might be a plausible model--you get rid of ideas like 'uility maximization', 'rational expectations', and such and just view the economy as something like a rock or crystal with almost no nonequilbrium properties. You just add it all up, and maybe study its properties if you hit it with a hammer. Society may be like that (see Kirman about ants). (Kirman didnt mention Yakovenko who is givign a talk up here soon i may go to; he knows my critiques of his model, tho a few other people have also mentioned them). If I understand this right it means that economics (or maybe all sciences?) is doomed no matter what the economists try to do. Uplifting! In your account of the various strands of evolutionary economics you forgot the pivotal connection: Malthus is the key figure, he represents the deep unity of Political Economy and Darwinism. Economics is a cargo cult science, that is, it always copied genuine science without ever getting on its own scientific feet. The history of economic thought consists of two main strands. First, economists copied Newtonian physics then they copied (re-imported) Darwinian biology. Having NO own scientific gravitas economists jumped on every bandwagon from game theory, to evolutionary game theory, to chaos theory, to complexity theory and had their dilettantish fingers in every pie from psychology, sociology, anthropology, history, political science, social philosophy to biology/Darwinism. Curiously, until this day the representative economist has no idea of the foundational concepts of his own discipline, that is, of profit and income. Walrasianism, Keynesianism, Marxianism, Austrianism is provable false. The fundamental distinction in economics is between political economics and theoretical economics and the fact of the matter is that political economics (= agenda pushing) dominates theoretical economics (= science) since the founding fathers. And this is why economics never rose above the proto-scientific level. The very characteristic of science is to TRANSCEND common sense. Therefore, there is no need at all to go into the details of Wilson’s soap box economics, his appeal to common sense is sufficient to disqualify him as a scientist. You and Noah both misread what Wilson says about the role of commmon sense: To recognize that homo economicus represents "a conception of human nature that is profoundly false, defying the dictates of common sense" is not a call to reject counterintuitive results that "transcend common sense" in some other domain. It is a call to avoid building theory and dogma on false assumptions. For years I debated with a close relative, a prominent political scientist at a major university, whether the economist’s utility maximization hypothesis was empty or not -- specifically, a tautology. Tautology because economists take as axiomatic that we seek to maximize utility. The framework readily yields downward sloping demand curves or an inverse relationship between price and quantity, a relationship widely confirmed empirically. But I never really had a convincing reply to his taunts, at least not convincing to him. At the time, I was looking for an accessible statement of the basic ideas of neoclassical micro theory to give to my intermediate micro theory students, as the text, really all texts, really said little. I happened upon a nice little essay by the mathematical economist Roy Weintraub. He was also associate editor of History of Political Economy at Duke. He published it in an encyclopedia, but now it is has been moved tohttp://www.econlib.org/library/Enc1/NeoclassicalEconomics.html. It gave me a eureka moment, and so I got ready for the next time my relative raised the topic, which was shortly thereafter. I said to him: "tell me, when you make decisions, do you try to do the best you can under the circumstances? ", and he immediately became silent -- he has never been one to say that I am right - and has never raised the issue again. So I knew I was on to something. “Doing the best under the circumstances” for a personal choice is just the informal equivalent of maximizing utility subject to a constraint or set of constraints, and that is the essence of the neoclassical rationality model. So as this level of abstraction, it is a pretty good description of our basic decision making process. The sentence in Weintraub's essay that set off the light was this: "The neoclassical vision thus involves economic "agents," be they households or firms, optimizing (doing as well as they can), subject to all relevant constraints". It is clear that I had simply rephrased this. Now Weintraub was not really saying anything original, but his clarifying turn of phrase was just what I wanted. The rephrasing seems to work quite well in getting the point across when other scientists denigrate the economist' srationality assumption, which is often. Prof. Wilson does not appear to be familiar with the findings in neuroscience that document that rationality also appears in animals and in particular is demonstrated in animal experiments. That is an important evolutionary result that he apparently ignores. The neuroscientist Paul Glimcher discussed the rationality assumption in neoclassical economics in his first book “Decisions, Uncertainty, and the Brain: The Science of Neuroeconomics”, and indicates that it is basically correct. His later book “Foundations of Neuroeconomic Analysis” points out how the basic economic paradigm needs to be revised in the light of new biological findings, but it does not reject the basic maximization hypothesis, both for humans and other animals. Further, this utility assessing capability is an evolutionary result, and it would seem to fit squarely into Prof. Wilson’s favorite framework. Take notice that the statement: “The framework readily yields downward sloping demand curves ...” is provable false. You could know this from (Mas-Colell et al., 1995, Sec. 4C) or from Wikipedia*. These premises are forever unacceptable. It should be pretty obvious that the neo-Walrasian axiom set contains THREE NONENTITIES: (i) constrained optimization (HC2), (ii) rational expectations (HC4), (iii) equilibrium (HC5). Every model that contains a nonentity is A PRIORI false. In practical terms: as soon as the word equilibrium/disequilibrium appears in an economic paper it can be thrown into the waste basket. The same holds for utility maximization and all other nonentities. Take notice that economics from Jevons/Walras/Menger to DSGE contains HC1/HC5 and therefore is proto-scientific junk. Take notice that from the fact that BOTH neoclassical micro and evolutionary economics are degenerated research programs follows that it means NOTHING that they fit together and that neuroscience “confirms” utility maximization. Neither neuroeconomics, nor behavioral economics, nor biology, nor complexity theory, nor chaos theory, nor common sense, nor more empirical work can save economics. All this is lipstick for the pig. Walrasianism, Keynesianism, Marxianism, Austrianism is axiomatically false, that is, beyond repair. Nothing less than a paradigm shift will do. Wilson writes: "The edifice is based upon a conception of human nature that is profoundly false, defying the dictates of common sense..."
You reply: "Science usually places a premium on counterintuitive results, and "counterintuitive" is the opposite of "common sense"." Wilson says that the conception of human nature is false; you say that counterintuitive results are valuable. As a criticism, this is a nonsequitur. My life’s work gives me a panoramic view of the human-related disciplines such as religion, sociology, the humanities, and the philosophical tradition of pragmatism, to list a small sample. you can hardly complain about economists trying to apply utility maximisation and methodological individualism to everything under the sun. Also, if you're going to say that, perhaps you should consider generally winding your neck in a bit as it sounds a lot like "I'm smarter than everyone else." It strikes me he's doing precisely what he accuses economists of - hitting on a useful method in his own field and immediately running off, like the man with a hammer who keeps finding nail-like objects, to try it on everyone else's. I'm struggling to see how evolutionary theory fits in with economics. I get that evolutionary psychology might be useful to help discovery why it is that we humans make certain decisions - why we might consider certain types of utility "better" than others, say, such as the asymmetry in how we value gains versus losses for example. That certainly has economic implications, but it's the "what" not the "why" that matters. Consider the prisoner's dilemma in game theory. Then consider why the person who takes the non-cooperative, self-beneficial choice may get beaten to a pulp. Does this help connecting evolutionary psychology with economics? It does so because any process that involves variation and selection can be considered an evolutionary process. Human behaviour involves variation and selection - of behaviours - hence is an evolutionary one. Economic behaviour is a subset of human behaviour, one that also involves variation and selection (of behaviours related to the economic realm), hence economics can be studied from an evolutionary perspective. How does it involve variation and selection? Consider why you perform the behaviours that you do? Do you continue performing behaviours that are unsuccessful? Do you continue performing behaviours that are successful? Do you stop performing behaviours that were once successful but are not unsuccessful? How is this not variation and selection? "I'm not so sure I like the emphasis on common sense." No! The emphasis was on the "profoundly false". His suggestion is that common sense should at the least be given a try -- and then goes on to the "more refined dictates of psychology and evolutionary theory". His emphasis was on what he saw as simply false in economics. I can't say what he personally refers to, but I would cite perfect rationality, perfect information, innumeracy regarding population growth, ignorance of the second law of thermodynamics, perhaps disregard of mass and energy conservation. "Science usually places a premium on counterintuitive results, and `counterintuitive' is the opposite of `common sense'." No, the counterintuitive results only appear, if the data force them on us. Although there is a problem with intuition: objects fall -- that's common sense. Objects move in a straight line at constant speed if no outside force acts on it: counterintuitive, because it's not understood that the tendency to slow down is due to a force of friction or resistance. 1. Study and learn quantum mechanics. 2. Study and learn Hamiltonian-Jacobi Theory. Again, physics accepts these counterintuitive results not because they are counterintuitive, but because reality forces them on the physicists.